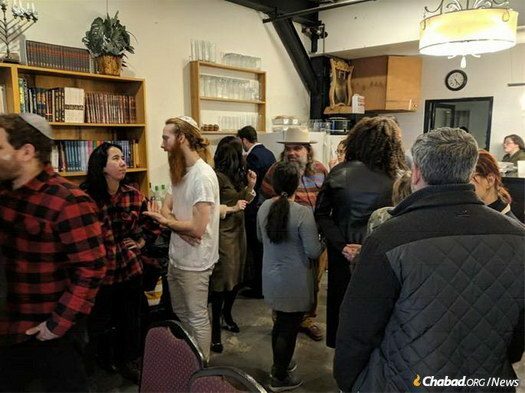 A dozen or so people lingered over the remnants of the Shabbat meal at Chabad of Bushwick on an unseasonably warm Friday night earlier this month, engaged in conversation with Rabbi Menachem and Chana Heller, who co-direct the popular synagogue and Jewish center—the only one in the neighborhood. The Heller children sat near the center’s large picture window. 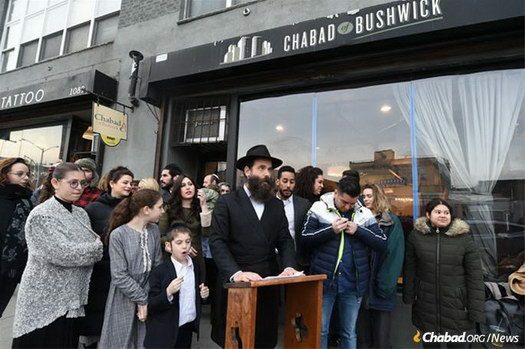 On the other side of the pane of glass, the words “Chabad of Bushwick” stood out among the gray facade of the 88-year-old building on Flushing Avenue, a welcoming and peaceful oasis amid the concrete and brick. That Friday night, the peace was abruptly shattered along with the picture window. 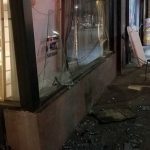 Unknown vandals smashed the window, scattering shards of glass into the room and onto the sidewalk. The moments that followed were filled with confusion, fear, even shock. The community’s reaction? 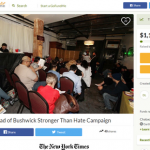 In the face of adversity, they would bring more light to Bushwick. Nestled among the Bedford-Stuyvesant and Williamsburg neighborhoods in northeast Brooklyn, Bushwick may not be the first neighborhood that comes to mind when discussing the 500,000 Jews who live in the borough, but it’s home to a proud and growing Jewish community. And since 2008, a thriving Chabad House has offered weekly Shabbat services and meals, Torah-study classes and holiday programs. Cortnie Loren Miller, who began her spiritual journey 10 years ago at Chabad of Bushwick, went back to her old neighborhood for Shabbat. 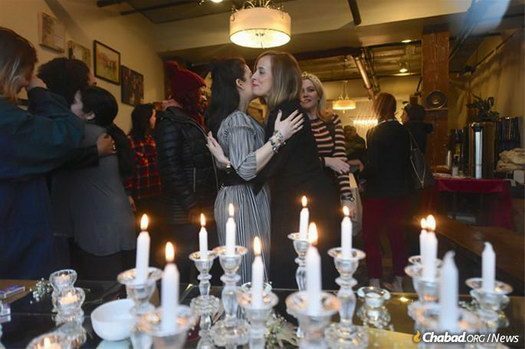 “Seeing so many new faces and so many familiar ones, seeing my rabbi speaking, welcoming everyone—that showed me that unity and inclusiveness will always be our community’s message,” she said. 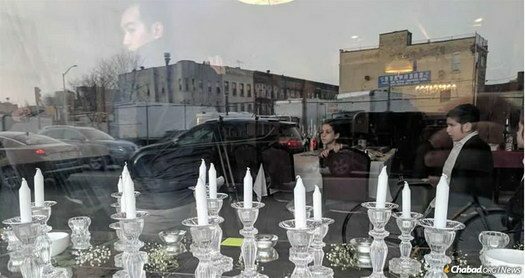 In the newly replaced window stood dozens of Shabbat candlesticks waiting to be lit as Chana Heller took the podium in front of the Chabad House. She spoke about the power of positivity, evoking the Chassidic adage that darkness is not fought, but overcome by adding light. She said that to rededicate the Chabad House, the first thing they would do is increase in light—welcoming Shabbat and welcoming everyone in. “A little bit of light pushes away a lot of darkness,” said Rabbi Heller. 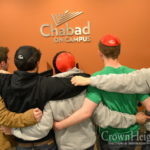 He acknowledged the outpouring of support the Chabad House had seen from people of so many nationalities and religions. He spoke about the power of unity in overcoming hatred, and he invited the community members to rededicate the synagogue by lighting Shabbat candles. 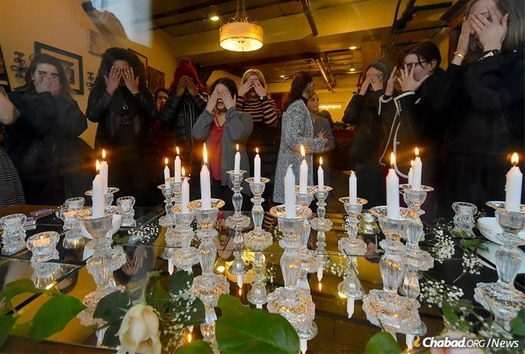 United, they entered the Chabad House as Jewish women and girls set match to wick, bright lights reflecting where shards of glass had littered the floor. 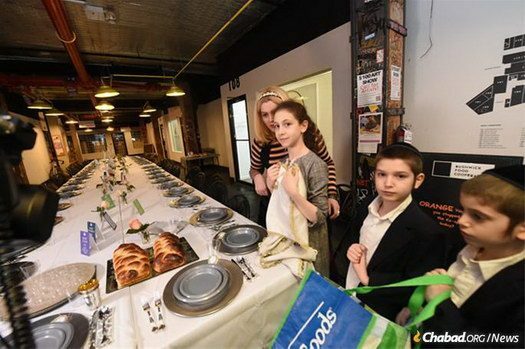 They said the blessings, ushered the light of Shabbat into the room and began a Shabbat meal for more than 100. Photo Todd Maisel – All photos were taken before the onset of Shabbos.